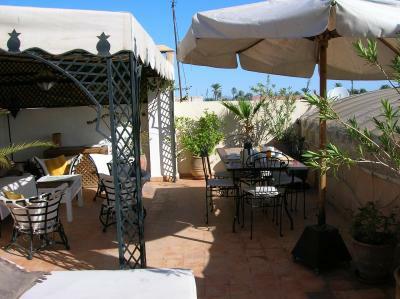 Lock in a great price for Riad Irene – rated 9.2 by recent guests! When we arrived, the gave us a lot of information about the city, the habits and nearby restaurants and visits, which was very practical. They were also just nice to have a chat with. This is an oasis in the Medina. 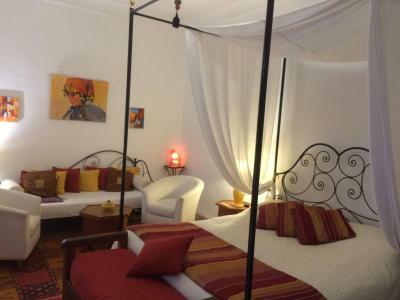 You can feel really tired in the Marrakesh Medina (it is very demanding for your senses) and once you enter the riad you feel the calm and can relax. 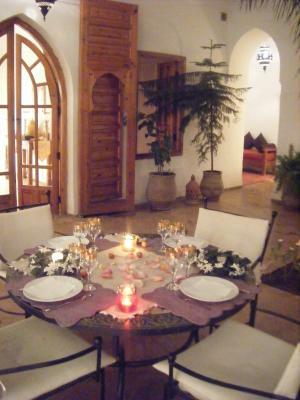 Breakfast and dinner at the Riad are a great relaxing and tasteful experience. In the morning you wake up with the song from one small bird (which is difficult to believe if you have spent the day before in the Medina). Room air conditioning was soo good at this time of the year (40C outside). 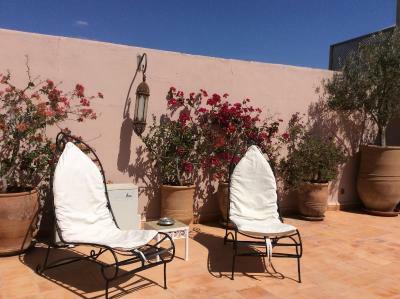 We loved our stay at Riad Irene! 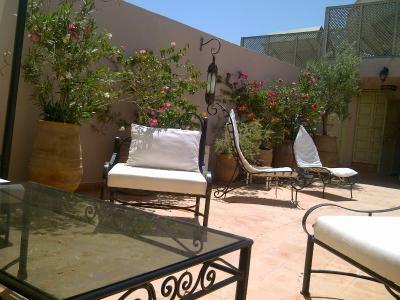 The Riad featured many spaces to sit and appreciate the beautiful decorations, and peaceful atmosphere. The included breakfast was fantastic (far better than any other included brekky we've had!). Additionally, the host went above and beyond to ensure we had breakfast the morning of a very early flight. From reading other reviews, we were worried that the location in the medina would be problematic, especially with plenty of eager local kids trying to "help out". Before checkin we received a really helpful email, and upon arrival we were given a map that made navigating all the way though to Jamaa el'Fna easy! Walking though the backstreets we were able to experience the non-touristic side of Marrakech. 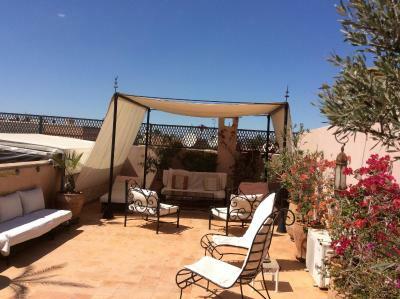 One of the best riads we have stayed in (from a total of 4). 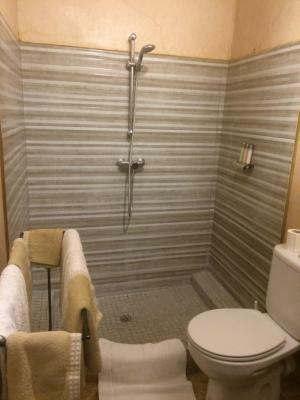 The rooms are nice, clean, there is AC which is heating the room, the bathroom is big and you have everything you need (soap, shampoo, shower gel, even body lotion). The place where they serve breakfast is absolutely gorgeous, the host woke up earlier to serve us, because we were in a hurry to get to Majorelle Gardens. 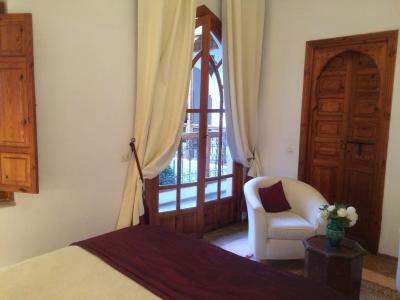 There are maximum 20 minutes walking distance to Majorelle Gardens and the same to Jemaa el-Fna. The prices for the airport transfer they are able to offer for you are cheaper than in other riads. We totally recommend it! 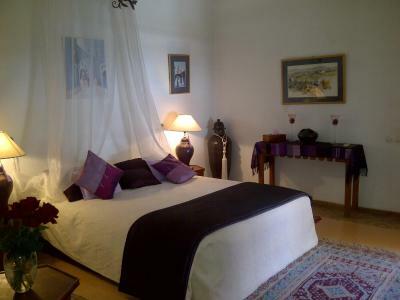 Very nice riad!! So clean and beautifull. The staff is nice, the breakfast amazing. Perfect in every detail! The fantastic hosts: Pascal and Irene and the rest of their staff. The big and beatifully arranged rooftop terrace. 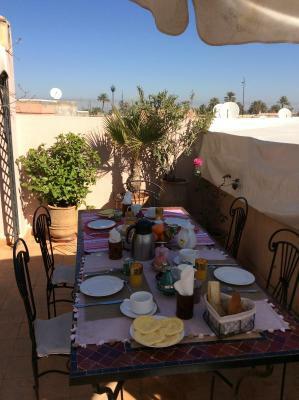 When it comes to hosting this riad was a step up from the other riads we have been (which all were fine btw). Good location, tasty breakfast and an amazingly warming welcome. 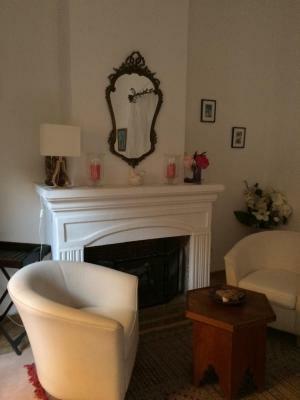 We choose this location because of the great reviews about the hosts and location, but our expectations were even exceeded. 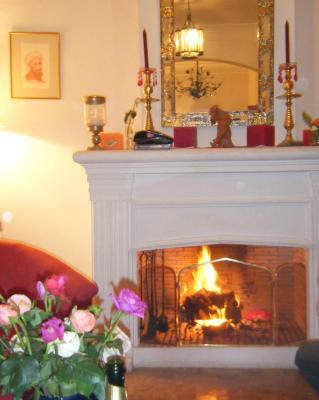 Zakia and Abdou are the friendliest, most polite and caring hosts we ever encountered. Thank you for making Marrakech even better for us! 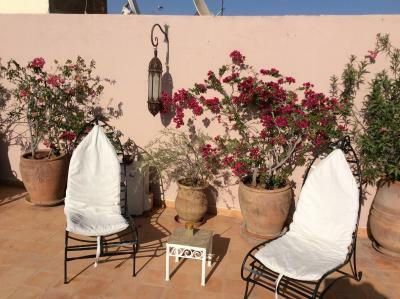 We had the most wonderful stay at Riad Irene! The hosts on the property Abdul and Zakia were so lovely, even though we didn't speak French or Arabic, we managed to gesture our way through everything. 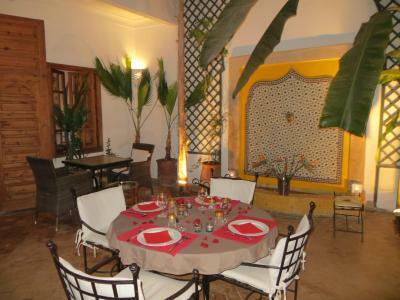 The were so attentive and we treated ourselves to a meal and some wine at the Riad one night that Zakia cooked us and it was so beautiful and delicious! Irene and Pascal communicated via email and helped us organise tours etc which was fantastic. 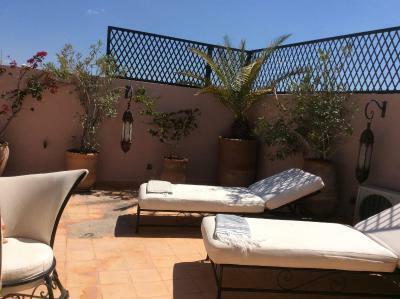 We thoroughly enjoyed our stay in this beautiful little haven of a riad and will stay here again without hesitation if we come back. 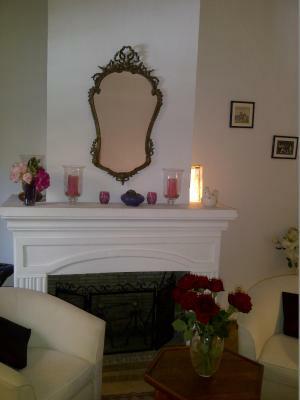 Wonderful, comfortable, clean and cosy! Very friendly team, organise a taxi for you and provide a lovely big breakfast straight when you get up. 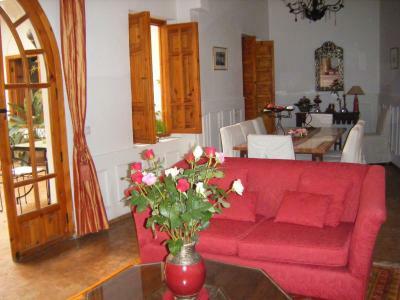 In the Médina, few nice restaurants 10 min walk away and the main square about 15 mins. 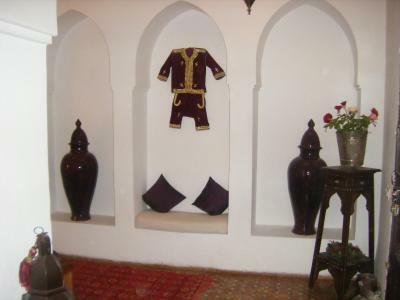 This traditional Moroccan riad is located in the heart of Marrakesh’s medina district, right by the ramparts. 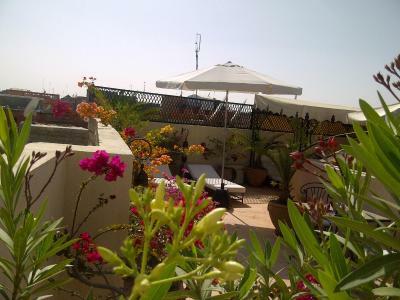 It features a rooftop terrace with a dining area and panoramic views. 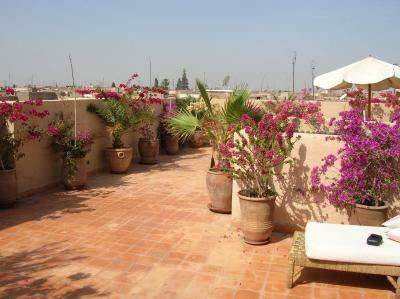 The guest rooms at the Riad Irene are organized around a central patio and have private bathrooms. Each is air-conditioned and equipped with free Wi-Fi access. 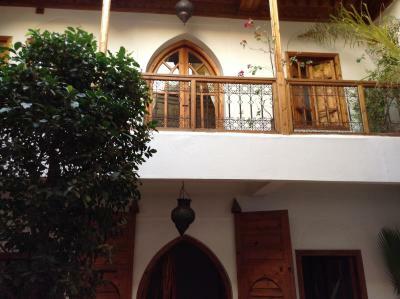 Additional facilities at the Riad Irene include a Moroccan lounge and a kitchen. The reception is open 24 hours a day and an airport shuttle is available. 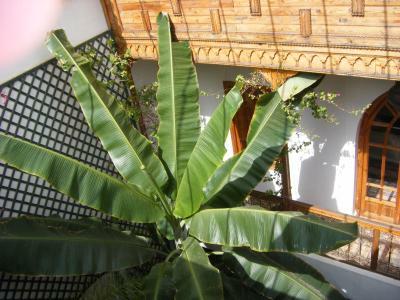 Medina is a great choice for travelers interested in markets, street markets and souks. 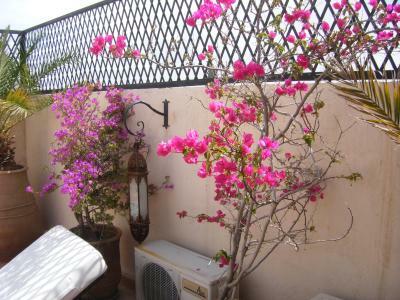 뀐 Located in the real heart of Marrakesh, this property has an excellent location score of 8.1! 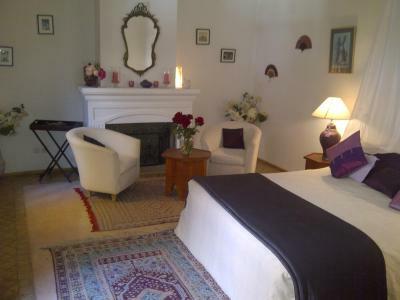 When would you like to stay at Riad Irene? 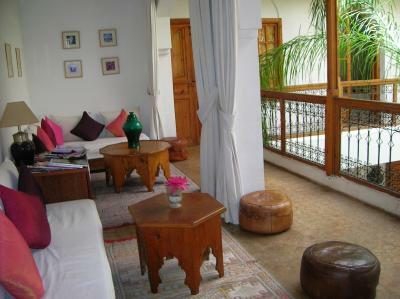 Overlooking the patio, this suite features a cream-colored tapestry-style bed spread and Moroccan Dess and Bejmat rugs. 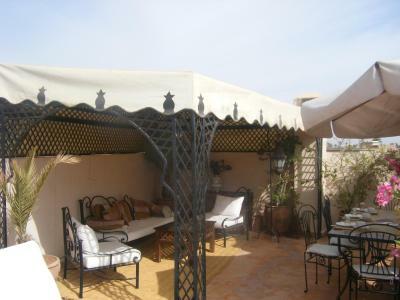 It also offers direct patio access, 2 armchairs and Tadelakt lamps. Public parking is available at a location nearby (reservation is not needed) and costs EUR 2.50 per day. 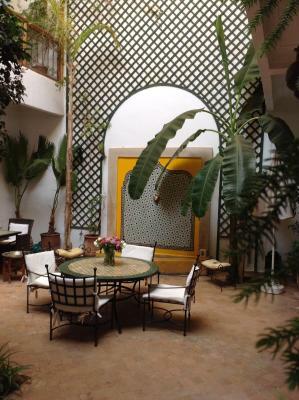 Located on the 1st floor, this room overlooks the patio and offers a Moroccan-style décor. 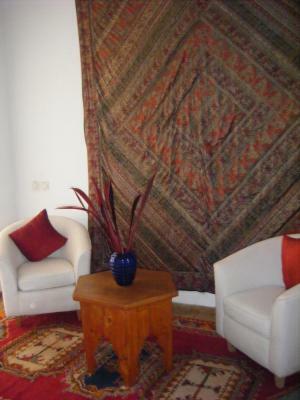 This room is decorated with Moroccan Dess and Bejmat rugs. 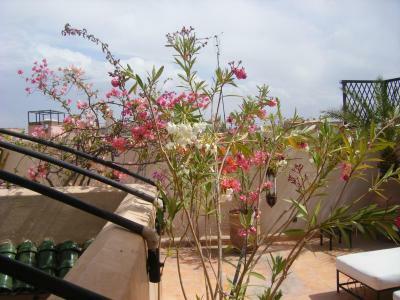 Area Info – This neighborhood is a great choice for travelers interested in markets, street markets and souks – Check location Great location - show map Guests loved walking around the neighborhood! 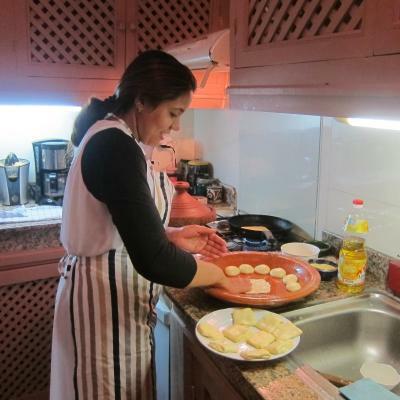 House Rules Riad Irene takes special requests – add in the next step! Riad Irene accepts these cards and reserves the right to temporarily hold an amount prior to arrival. 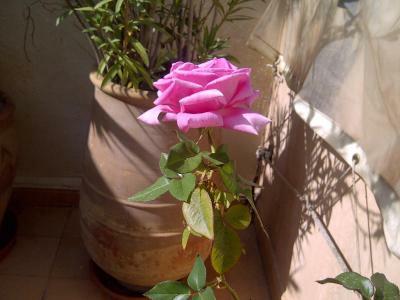 Please inform Riad Irene of your expected arrival time in advance. You can use the Special Requests box when booking, or contact the property directly using the contact details in your confirmation. Very little! 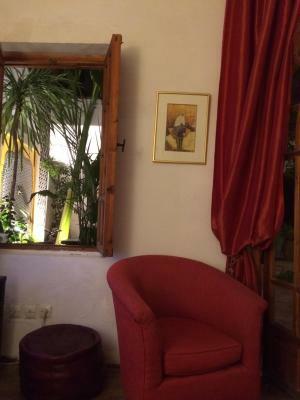 You'll have to be quiet at night, due to the close living situation of the Riad, however I doubt this is unique to Riad Irene. The staff picked us up when we arrived by taxi, but it was a really weird situation. We had just arrived and some other guest was about to leave. We were rushed to leave the taxi to give the next people the taxi. The driver that was sent from Riad Irene didn’t say a word to us as we left and neither did the staff. The staff didn’t talk to us the whole way to the Riad, and we were very confused. 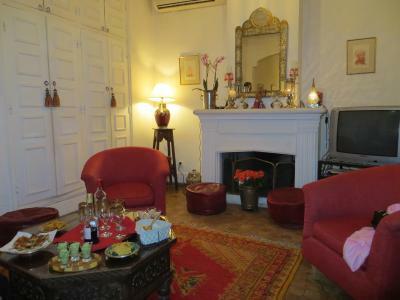 As we got to the Riad we got some mint tea but no one talked to us at all. We didn’t feel welcome at all. We had to ask where our room was since no one was talking to us. When we go to the room we found out there’s no key and when asked they just said there’s no key and only them there so we should feel ok. We get uncomfortable and unsafe. Which made us feel even more bad in Marrakesh. To other guest they seemed nicer to, we don’t speak Arabic or French but it shouldn’t be a problem. The air conditioning is working very loudly so it was hard to sleep with it on. We got the room with the window to the street, so it was really loud at 6-7am. The kids on the streets are telling you you’re going the wrong way and offers you to show you the right way. Luckily we read about this so nothing bad happened. The terrace and room looked nice. We got mint tea as a welcome drink, standard breakfast. We asked for breakfast 6.30 and there wasn’t any problem, as we would go early to the desert. Location is easier to find then what we read on the reviews, the offline google maps help us the first times. It was nice to have heating/AC in the room as the room gets cold. It was nice to have a hairdryer in the room. 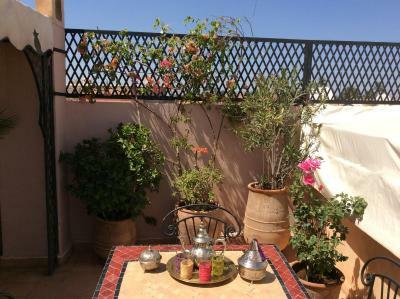 The location is a little bit hard to find, but you will receive a map that makes everything easier and at first when you arrive there, someone is coming to lead you to the riad. Their English is no very good, but they speak good French. Un poquito lejos de Jemaa el-Fna, pero se puede caminar tranquilamente! 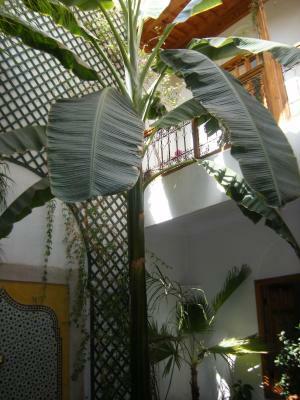 We were already warned by our hosts upon our arrival, but be careful with the kids around the riad. When you get lost (which will most likely happen the first time in the small streets of Marrakech), they will insist to bring you to your riad or guide/follow you towards your destination but harshly demand you to pay afterwards. 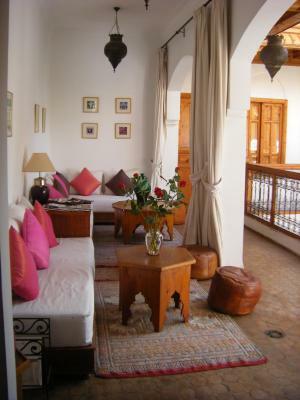 Best Riad in Morocco. Would be a mistake not to stay here. 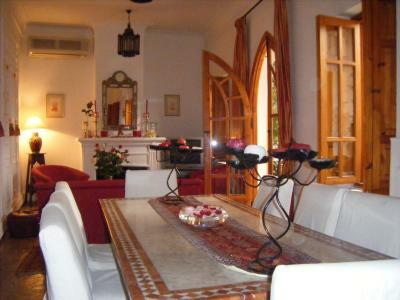 It is Located a 20 minutes walk from the main market, which is not a problem. 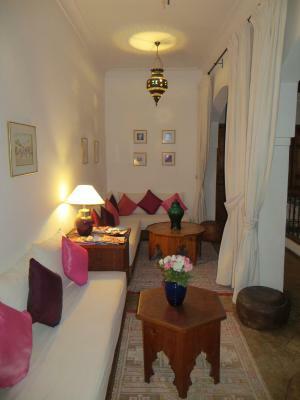 However I found the area of the riad dangerous, especially if you are not travelling with any men. I had a few very bad experiences with the men in the area, which made me scared to go out in the evening. 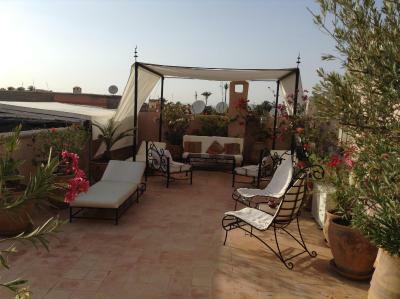 Its a shame as it is out of the control of the staff at the Riad and I would of given full marks to the Riad itself. The Hotel is Beautiful, the staff are beyond helpful and welcoming. On arrival and throughout the stay, we were given loads of information and advice about the local area, excursions, the market and the people. The staff go out of their way to make you comfortable, and the owners seem like they genuinely enjoy hosting their guests. The dinner is so so delicious, seriously the best food we had in Morroco, definitely order dinner at least once while staying here. No accessibility to taxi and have to walk 8 minutes to get a cab. Get ready to be lost in alleyways :). You do enjoy it for the first few times. Also on the way to the property lot of street kids and youth trouble you. Abdou the host though doesnt speak english us very kind and helpful. Will go out of his way and help as much as he can and always has a smile on the face. 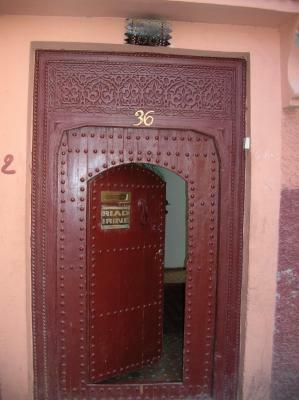 We travelled as a couple, but if travelling alone (as a woman) it’s very dark to walk in the passage to the Riad. We arrived after midnight and the nightwatcher came and picked us up in front of the Medina. He and Zakia have been so kind and helped us with everything.